Here is where you would find them. 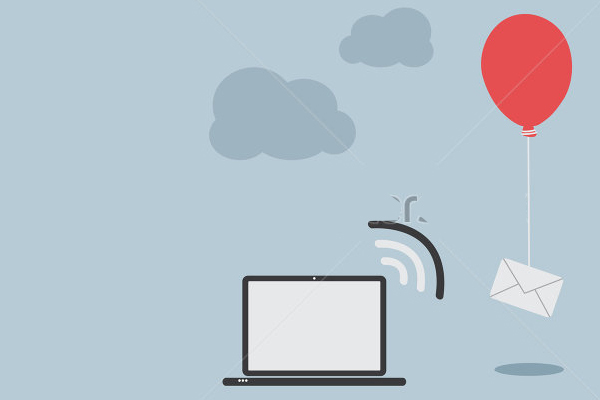 Let us review this for keyword opportunities – improving CTRs and Conversion rates. We can see for the Google Search: Other category (Keyword 1 – 2nd row in the snippet above) we have impressive numbers across the board – High Impression Count, Low Cost Per Conversion and High Conversion rates. However we notice that CTR is low (compared to Keyword 3 and Keyword 7. The Average Position is 5.1 (compared to 2 and 2.2 for the neighbouring Top position keywords) – This is because the Ad does not show up in the Top position. Given that Top positions garner higher CTRs, this is a great keyword for us to move to the Top position by bidding higher. The current Avg CPC is Rs.34.33 – we could possibly bid up by 50% to move this to the Top position. Such a move could increase CTRs for Keyword 1, comparable to Keyword 3 and Keyword 7 – and potentially increase absolute # of conversions and conversion rates. Similarly we can hunt for other keyword opportunities where we can bid up from Other to Top position – for higher campaign monetization. When the report carries hundres of keywords, a better way to start the analysis is to Pivot the report by Keyword Match Type and Ad Position – see below. 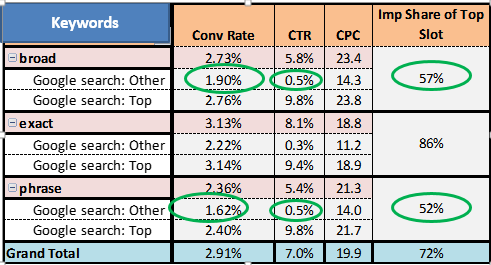 Then review for Conversion rates and CTR, especially where the Impression Share for Top Slot is lower (say below 70%). In this case below, Broad and Phrase match type fit the bill. This would mean that by bidding up higher and increasing the Top Impression share, there is an opportunity to increase CTR and Conversion rates for the Broad and Phrase Match categories above. We can drill down to keyword level analysis (as seen earlier) once the opportunity is identified at a Match Type category level. Sometimes conversion rates / conversions could be zero or very low. In those situations we can consider engagement metrics like Bounce Rate and Pages per Session for ranking better performing keywords and bidding higher for them. The rationale here is these are probably more successsful top of the finnel visits and could turn into converting keywords, given additional investments. We should monitor these keywords weekly for positive improvements and iterate continuously. This entry was posted in Digital Marketing and tagged Conversion rate Optimization, Google AdWords, Google Analytics, Top vs Other Report.